Guitar Hero: Aerosmith is a music video game developed by Neversoft and published by Activision. It was released on the Xbox 360 and PlayStation 3 consoles, with a Wii version developed by Vicarious Visions, a PlayStation 2 version by Budcat Creations and with a PC and Mac version by Aspyr Media. The game was released on June 26, 2008 in Europe, on June 29, 2008 in North America, and on August 6, 2008 in Australia. 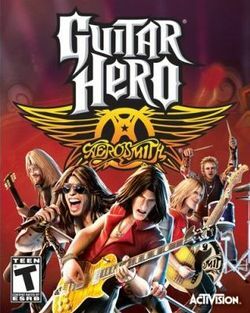 Guitar Hero: Aerosmith sold as both a bundle with a specially designed guitar controller as well as a game-only package. The game is considered an expansion in the Guitar Hero series, extending upon the general features of Guitar Hero III: Legends of Rock. As with other games in the series, the player uses a guitar-shaped controller to simulate the playing of rock music by playing in-time to scrolling notes on-screen. It is the first game in the series to primarily focus on the work of one rock band, with Aerosmith songs comprising approximately 60% of the soundtrack, while the remaining songs are from bands that have been influenced by or opened for Aerosmith. A departure from other games in the franchise, Guitar Hero: Aerosmith follows the career of Aerosmith, by playing significant songs in their catalog in a somewhat chronological order. The gameplay follows the band through various periods in its history, spanning from its first show at Mendon Nipmuc Regional High School in 1970 to the 2001 Super Bowl XXXV halftime show, to their induction into the Rock and Roll Hall of Fame on March 19, 2001. The player starts as Joe Perry, and will eventually be able to unlock Brad Whitford and Tom Hamilton. This page was last edited on 20 February 2018, at 06:20.